DFS value chart for 2015 Travelers Championship. Golfers above the line are good value while those below are poor value. Zoom in of selected orange region in first screenshot. Note the coloured text on top changes to reflect your selection. The first four charts above are on the new DFS rows in the Prediction Data page for each golfer and show the progression of each metric through the current GP season. The seven remaining charts are on the Rankings (DFS) page and pick out the best/worst golfers for each metric in the tournament field. Note that the DraftKings data only started in Golf Predictor last week for the US Open. Also, rank and salary for a tournament are equivalent, since the highest rank (1) is the highest salary and so on. The first ten charts are familiar bar and line charts, but I'm particularly proud of the last chart listed above! 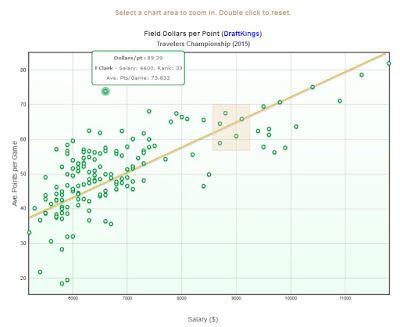 This field Dollars per Point chart is a combined scatter/line plot and it shows value in the tournament at a glance. It is basically a visualisation of the colour coded dollars/point column on the Rankings (DFS) page and can be seen in the screenshot above for the 2015 Travelers Championship. The yellow line represents the average dollars per point for the field and the green points are the dollars per point for each competing golfer. Hovering over these green points will reveal details about the golfer it represents, as shown above for Tim Clark. To spot value, all you have to do is look above the line (for golfers whose salary is low for the average points per game that they have). Conversely, those points below the line represent the poor value golfers. Golfers on or near the line have been priced about right relative to the field. Golfers with an average points per game of zero are not displayed on the chart, but are listed beneath it. As can be seen above, the top salaried golfers tend to be overvalued on DraftKings, while most of the value is near the low end. Also, the further the point is away from the average line, the more under/overvalued the golfer is. For example, as can be seen above, Tim Clark is the most undervalued golfer for the 2015 Travelers Championship. 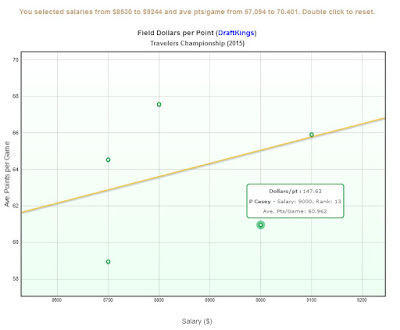 You can also hover over the average line at the same salary as the golfer (by going straight up/down from the golfer's point until you meet the line) to see what average points per game a golfer should have for his salary if he was to priced correctly relative to the field. 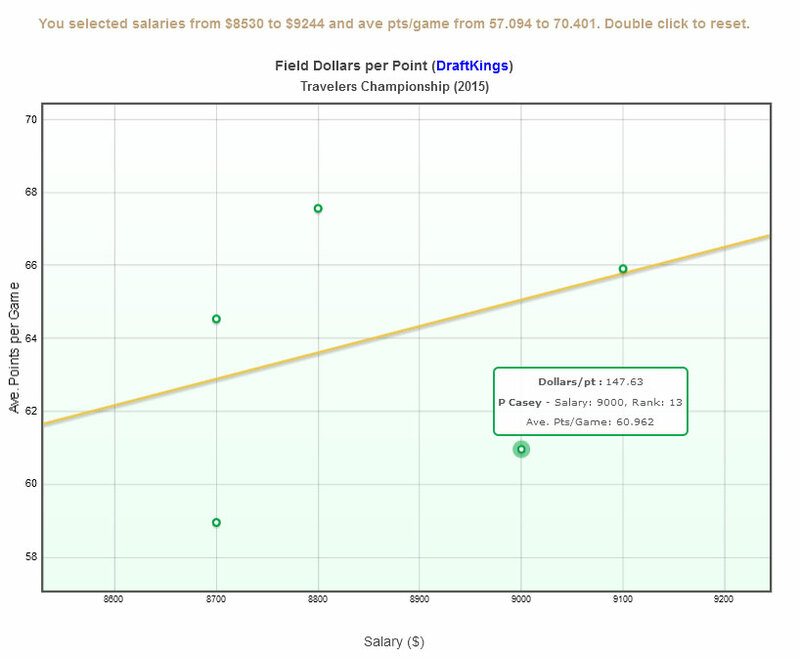 For Tim Clark ($6600), this corresponds to an average points per game of 47.709. 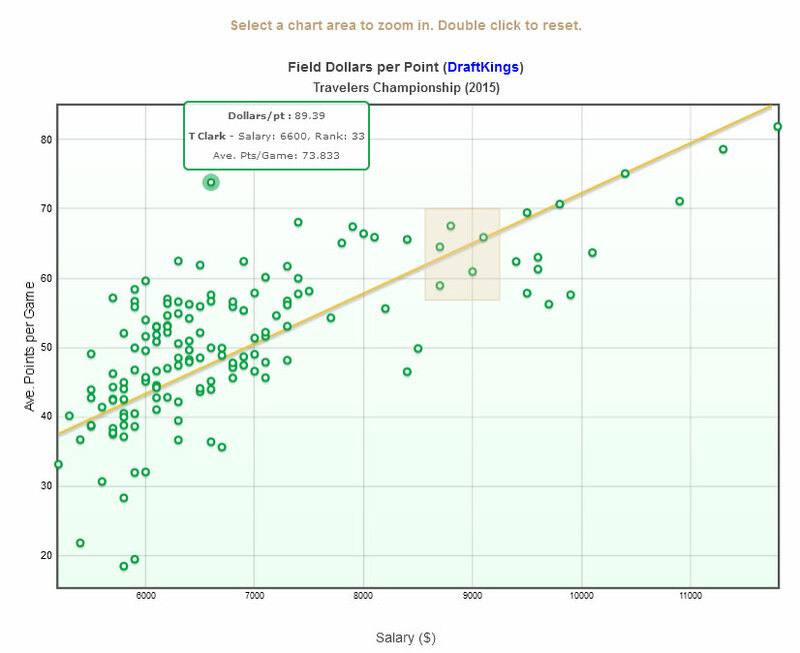 As Clark actually has 73.833 average points per game, he is significantly undervalued. As if all that wasn't great enough, this new chart is also zoomable! Because of the large number of points that can be very close, I have (after a long battle!) added a zoom feature to the chart. You can simply select an area of the chart with your pointing device to zoom in to see the points of interest better. To reset the chart to its initial state, simply double click the chart - it's that easy! This zoom effect is shown in the two screenshots above. If you select the orange region in the initial chart (first screenshot), you will see the second screenshot. You can keep zooming in, if necessary, to see two or more very close points separate. Note that the first screenshot is a composite as you can't hover over a point and select a zoom region at the same time! I think this is one of the best charts on Golf Predictor, even if it only useful if you are a DFS golf player! These charts bring the total number of charts on the site to 380. Only subscribers can view these new DFS charts, so sign up today and reap the full benefits of Golf Predictor, the premium professional golf statistics site. I should have mentioned that Tim Clark is probably so undervalued because he has been plagued by injuries.